The Albuquerque Game Developers Guild Arcade Cabinet is where game developers get a chance to showcase their work to the local community in a fun high profile way! To submit a game to the AGDG Arcade Cabinet you will need to have a game you will have to meet all requirements. Please follow each requirement below before submitting. Run on the Windows 7 or higher operating system. Must not have any malicious software/code that can corrupt the system. Since this system is going to be for a general audience try to keep your game below an M rating. Cursing should be kept to a PG rating. No using other people’s trademarked or copyrighted content without permission. Description of your game in 200 words or less. Genre tags of your game (eg. Platformer, Shooter, etc.). You may have multiple tags. (Optional) Video of your gameplay or game trailer at 1920×1080 resolution in .mp4 format. Download the ArcadeGame.zip file to your computer. Unzip the folder to your computer. Copy your game to the new folder. In the <title> brackets put your games name. In the <gameStudio> brackets put your studio’s name or your name. In the <description> brackets put a description of your game. Open the media folder and copy your screenshots and videos in the folder. Your game.xml file should look like this. Zip up your game folder and upload it to either Dropbox or Google Drive and email the link to abqgames@gmail.com your game will then be pending review. The arcade machine will have 2 player controller layouts each with a joystick and 8 buttons for your game. The machine will also have a home button that will quit your game and go back to the arcade front end and a killswitch which exits the arcade machine, these buttons should not be used in your game and will result in your game failing lotcheck if implemented. The process to set up your Unity game for the AGDG arcade machine is fairly easy and straight forward. First, we’re going to set up the buttons. Click into the Size text box and add 1 to the number in there. For our example, the Size will be 19. You will see the last input copied. In the new input copy the values from the screenshot below. Once you have that click into the Size text box again and add 7 to that number. For our example, the new size will be 26. Go through each new entry and follow these instructions. Once you have done this for all the new entries we have set up for one controller. We will now get the buttons for the second controller. Change your Size and add 8 more inputs (we’re now at 34). Once you have all of these buttons setup we will get the joystick inputs. Add 1 to the Size (we’re now at 35) and make the input match below. Change the name so it will be ArcadeOneVertical and change the Axis to Y axis. 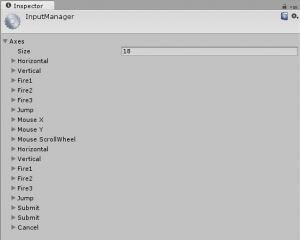 Now that you have all of the inputs in the Unity Input Manager you can call them from code. Here is a small code snippet on how you will call the inputs. Make sure your UI can scale correctly and that your anchoring is set correctly so no UI element is clipped or offscreen. Your UI must also support JoyStick navigation. Click here to learn more about the Unity UI system. To get your game on the arcade machine your games build settings must be configured correctly or else you might fail review and have to resubmit. 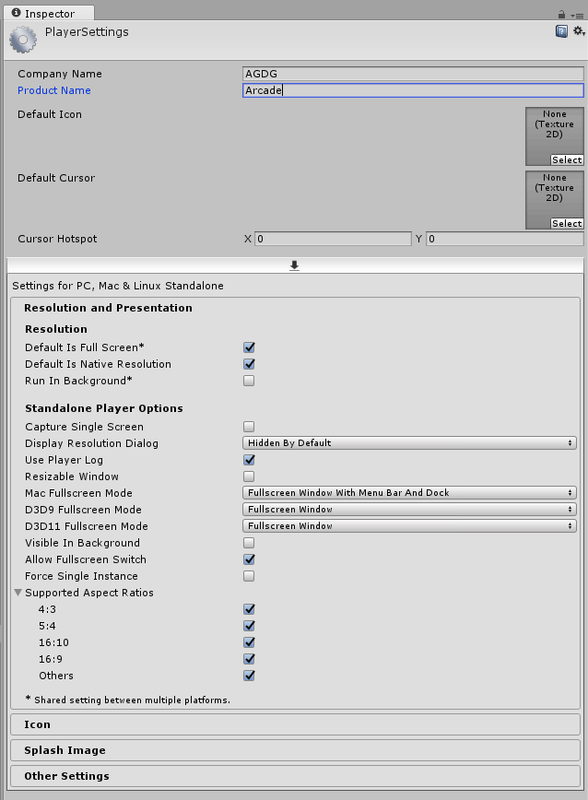 First, go to Edit->Project Settings->Player to bring up the Player Settings. In these settings, you will have to set a few values. Change your Company Name to your studio or name. Change your Product Name to your games name. Once you have all of these set you can build your game. Please output your game for the Windows Platform (x86 and x86_64 are both acceptable). To get your game onto the AGDG Arcade Cabinet it has to be able to work without a network connection and must not open to any external links through a web browser or else your game will fail review. Because the arcade cabinet requires a portable .exe solution to run, you will need to use one of the solutions below (or a something similar) to execute your game. Electron provides a portable implementation of the Chrome browser that can be used to help HTML5 apps appear as native apps (plus access to other native functions). As far as we’re concerned here, Electron is a slightly smaller and easier-to-setup version of Chrome Portable in –kiosk or –app mode. Download one of the latest (non-beta) prebuilt binary from Electron’s Releases page. Use one of the electron-*-win32-x64.zip files. Add an app folder to the electron\resources folder to create electron\resources\app. Your game’s startup HTML file needs to be named index.html. Copy that and all supporting files and folders into the app folder. Complete the How to Submit instructions above by copying the entire contents of the electron folder into your game folder as instructed in the submit steps. If you need a more robust test environment for Electron app development, see Electron’s Quick Start Guide to set up their Quick Start app, where you can drop in your game’s index.html and other files. Rebranding: Rename electron.exe and edit it’s internal icon to whatever you want. The above is for Player 1. Player 2 is at getGamepads(). Buttons F1 and F2 are shared from Player 2’s controller. //Call gameLoop() somewhere during load to start it. While PICO-8 was not intended to be an HTML5 platform, HTML is currently the only standalone export option for PICO-8 games. Refer to the PICO-8 Manual for instructions on exporting your cartridge(s) to an HTML and JS file. Complete the How to Submit instructions above by copying the entire contents of the electron folder into your game folder as instructed in the submit steps. The provided index.html file sets up 2 joysticks with 2 buttons each. This should work for most games without modification. If, however, your game is for more than 2 players or uses buttons from other joysticks creatively, you will need to modify index.html to your needs. Also note that PICO-8 does not define which action button is primary (BTN(4) or BTN(5)) or, even, which P8SCII glyph is primary (X or O). This has led to the current library of PICO-8 games being split as to which is primary. Thus, the standard here assumes that the image of the controller seen in PICO-8’s KEYCONFIG program follows the Game Boy layout, which would make button X primary and, thus, BTN(5) primary (which is also keyboard key X for player 1). If your code is written the other way, you will need to either reverse your code or reverse the code in index.html so that button 4 on the cabinet is always primary. If you use the P8SCII button glyphs on screen in your game, it is recommended you indicate button X as primary. Buttons F1 and F2 on the arcade cabinet are both set to activate the PICO-8 pause menu. One of these buttons could be set to a quick reset (Ctrl+R) but the pause menu offers a safer reset option. Edit index.html to set a background color other than gray. This file also sets the game div size to the largest multiple of 128px that will fit. You probably don’t want to mess with that, but may. At the time of this writing, Firefox appears to have some lag issues with sound and Chrome/Electron is performing well on all fronts. Considering that Electron setup is also easier and smaller than portable browser setup, there seems to be little reason to expand this section. 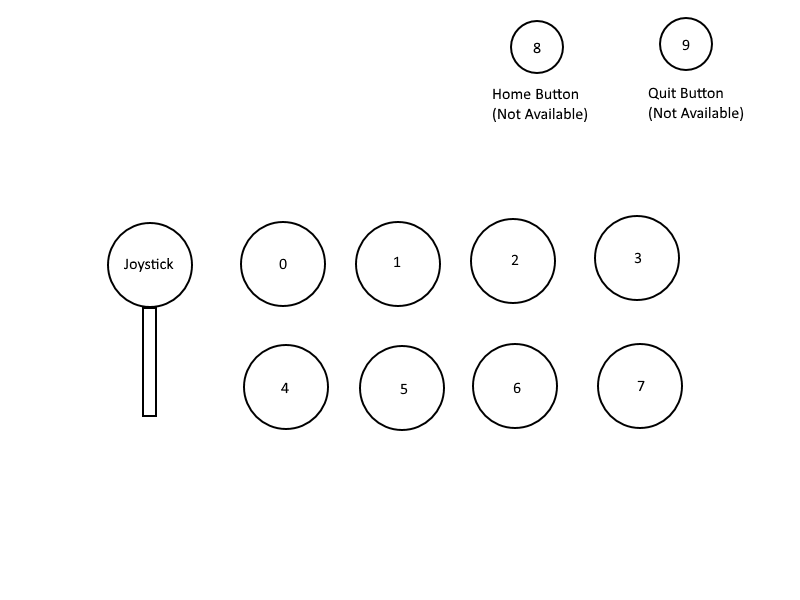 The buttons are the same as the above diagram (b0 – b7), joystick x is a0 and joystick y is a1. You will likely want to override the default button mappings from above. For example, you might change a:b2,b:b3,y:b1,x:b0 to a:b4,b:b5,y:b7,x:b6 or a:b4,b:b5,y:b1,x:b0 (etc.) and then save the new string to your game’s SDL controller file (i.e. gamecontrollerdb.txt).